No, Social Media Marketing is not only about likes and followers. Considering the First option if people use social media sites for personal use then likes and followers are important to many of them. 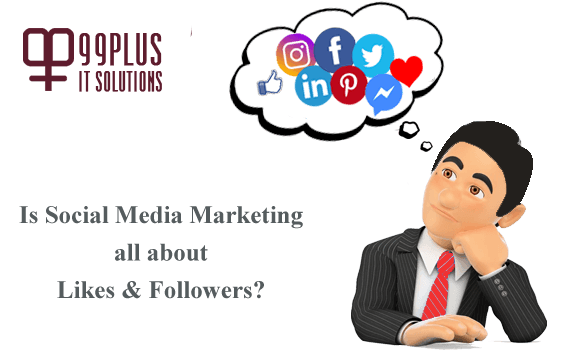 Considering the Second option if people use social media sites for Business then the number of likes and followers is not the first interest, the focus shifts on converting the visitors on social media sites into long-term customers. If not only about likes and followers then, what is Social Media Marketing all about? Social Media Marketing (SMM) is about increasing the visibility of the company. Social Media Marketing is about reaching a large amount of target audience directly with the help of social media platforms like Facebook, Twitter and Instagram. SMM is about introducing the concept behind your company’s products and services easily via regular updates on social media channels. Social Media Marketing is about establishing long-term relationships with the customers. Social Media Marketing is about building a Brand. A Social Media Marketing Company/Agency or a Digital Marketing Company/Agency offers SMM Services. What does the Social Media Marketing Company/Agency do? Social Media Marketing Agency regularly updates your social media feed that helps your company to stay connected with your customers hence social media marketing increases customer loyalty and strengthens customer relationships. Let’s take an Example of Facebook. A profile and a Facebook page are created to start with Social Media Marketing of your company’s products or services. Then your products or services are introduced to your target audience/potential customers using various social media techniques. This process is repeated on a regular basis to increase the visibility and customer base of your company. When the company’s social media profile and company’s social media pages are maintained regularly using various social media strategies then your company gets noticed in the eyes of the target audience and after that many of the potential customers start reaching out to your company directly. How Social Media Marketing helps the company? Social Media Marketing creates a win-win situation for you and your customers. Today almost everyone is available on at least one social media channel so with the help of SMM you find your potential customers easily and your customers find you easily. You can also visit our SMM Packages page for detail information regarding our Social Media Marketing (SMM) Services. We at 99Plus IT Solutions Pvt. Ltd. also provide other Digital Marketing Services like Search Engine Optimization (SEO) Services & Pay Per Click (PPC) Advertising Services.